Since 2007, HRN has supported a law school called Peace Law Academy (PLA) in Mae Sot, Thailand, near the border of Myanmar, with the aim of providing grassroots support for Myanmar youth who are striving to change their society under the legacy of the military dictatorship. We have been empowering these youth, who are bearers of the country’s future, by providing them a series of lectures and courses to teach on a wide range of topics, including international human rights standards, the international human rights framework for protecting rights on the ground, and comparative studies of various legal systems. The school has produced three generations of graduates since 2007, with over 75 students, including ethnic minorities and women. Today, many of the graduates have returned to Myanmar and are actively working to promote human rights and democracy in the country. 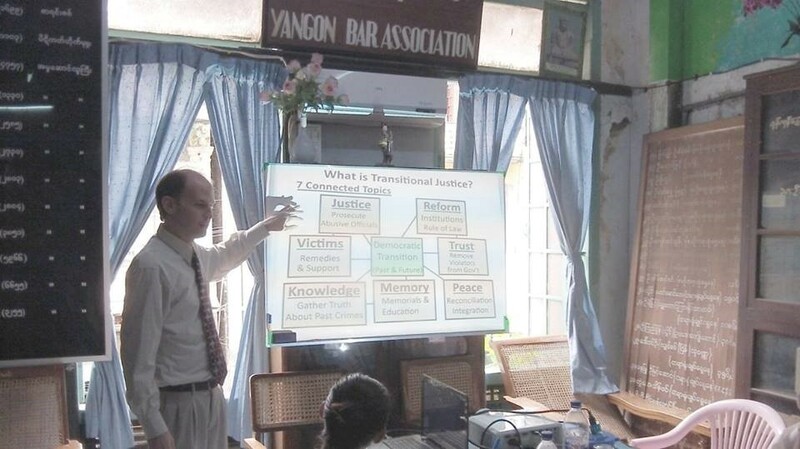 Since 2014, HRN has operated a human rights education program inside Myanmar in collaboration with the Yangon Bar Association to provide human rights education to local lawyers and citizens. 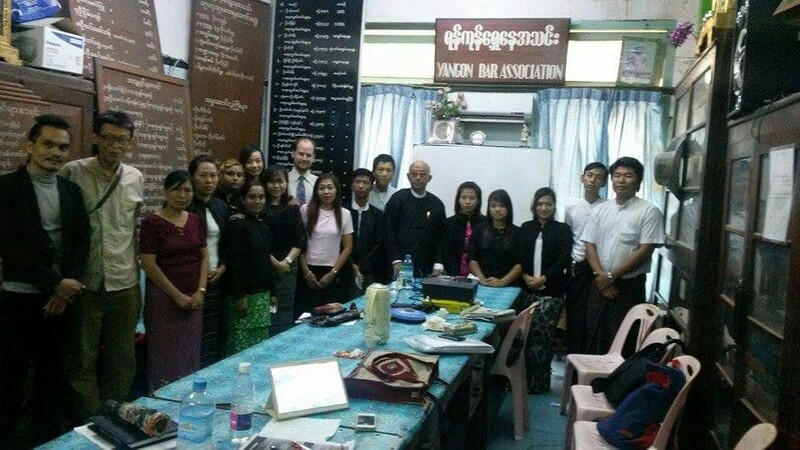 In February 2014, in partnership with the Yangon Bar Association, a group consisting of more than 3,000 lawyer bar members, Tokyo-based international human rights NGO Human Rights Now (HRN) began a new project with the aim of providing Burmese lawyers with educational seminars on internationally established safeguards for human rights such as the Universal Declaration of Human Rights. Support from the Japan Foundation enabled us to continue the project during the 2015 fiscal year. 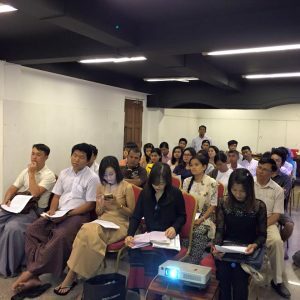 We held five seminars in Myanmar from May 2015 to February 2016; a total of 250 people attended the seminars and studied about human rights standards, rule of law, and the value of democratic society from Japanese lawyers, subject experts, and professors. 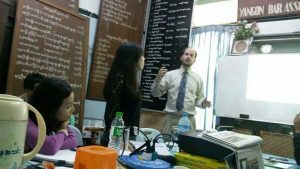 From 2009 to 2013 HRN operated the Peace Law Academy, a law school established to develop Myanmar’s future lawyers and community leaders, on the Thai side of the Thailand-Myanmar border. 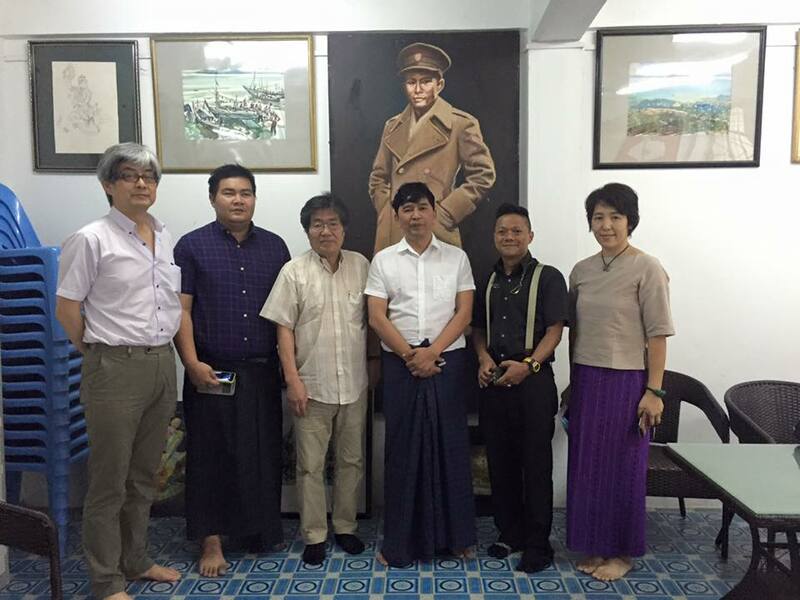 HRN sent lawyers and UN staff from Japan as lecturers, joining lecturers from Myanmar, on human rights and the rule of law, including international human rights law. The academy produced around 100 graduates, many of whom are now taking the lead in the democratization of Myanmar after returning to the country. (Click here to learn more about the Peace Law Academy.) Recent progress made in the democratization of Myanmar enabled HRN to launch human rights projects in Myanmar itself. Under the rule of Myanmar’s 25-year military dictatorship, speaking about human rights brought danger of arrest and punishment, and free speech itself–including education on human rights—was suppressed. In addition, many bar associations had to operate as illegal entities because organizations without approval of the military government were perceived as illegal. However, as democratization progressed, free speech came to be recognized as well, and discussions of human rights that would not have been permitted before have begun to take shape, enabling bar associations and other civil society organizations to take steps forward through human rights activities. 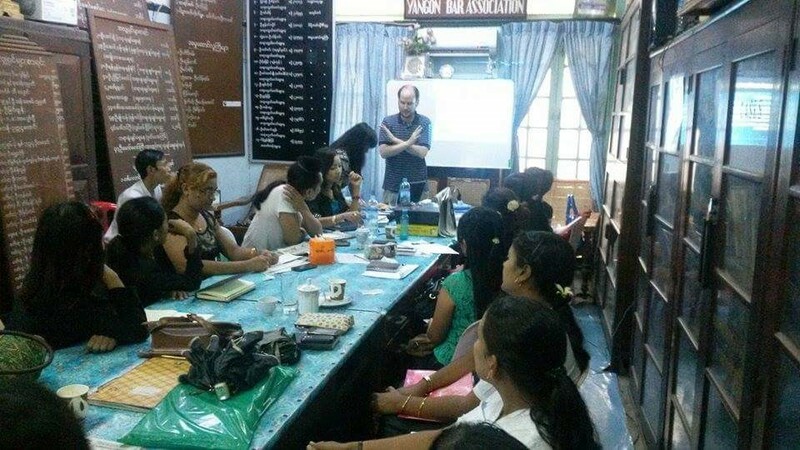 In response to all of this progress and to support the work of these organizations, HRN’s Exchange and Training on Human Rights in Myanmar is intended to provide training and make contributions, no matter how small, to the great success and work of the lawyers, students, and activists who will engage in human rights activities in the future. 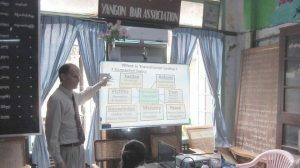 This project sent Japanese lawyers and other subject experts to Yangon for a total of five seminars on international human rights law given to audiences primarily consisting of lawyers, judges, and human rights activists belonging to or associated with the Yangon Bar Association. Seminars included lectures and group discussion of such topics as the basics of international human rights law, rule of law, the significance of the independence of lawyers; case studies of situations wherein Japanese lawyers were able to secure the protection of human rights through environmental lawsuits and suits for women’s rights; and open discussion of the human rights issues Myanmar faces and may face in the future. Attendees spanned a wide range of professions including lawyers, judges, and human rights activists. The lawyers and judges, who had never before received education focused on human rights within Myanmar, praised the program for introducing new concepts and providing them with a space to learn new values. When not giving seminars, the project team laid the foundations for stronger relations by holding discussions regarding the human rights issues facing local NGOs and the country at-large, current advocacy activities engaged in by local NGOs, and possibilities for future collaboration. This seminar covered topics such as the basics of international human rights law, the role of bar associations, and lawyers’ responses after incidents of pollution. The group divided into three for discussion and to prepare presentations on the theme “Human rights issues in Myanmar”. Group topics were 1) The bar association’s lack of independence, 2) Constitutional issues during the 2015 election, and 3) Other violations of the Universal Declaration of Human Rights occurring in Myanmar. This seminar covered topics such as the Convention on the Elimination of All Forms of Discrimination against Women (CEDAW) and General Recommendation No. 19, a case study of the sexual harassment lawsuit brought to ex-Osaka governor Knock Yokoyama, the social status of Burmese women, and Japan’s efforts to address violence against women. 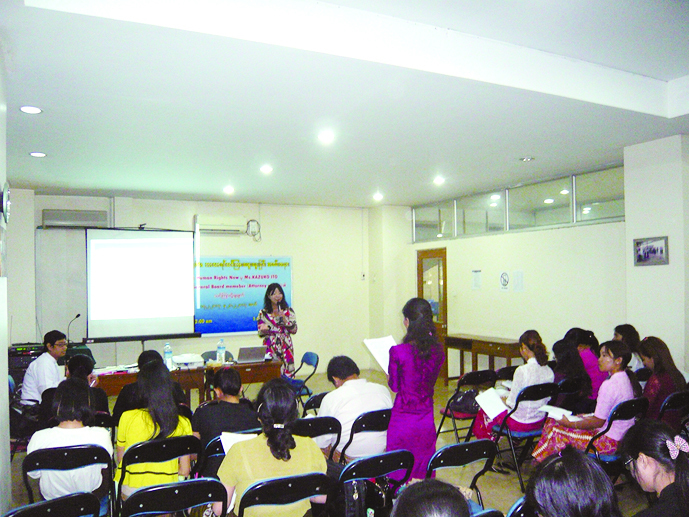 This seminar covered topics such as the Declaration of the Rights of the Child, the International Covenant on Civil and Political Rights (using a case study of hate speech and the freedom of expression), the report on the Myanmar government issued after a Universal Periodic Review (UPR), and the individual complaint mechanism. This seminar covered topics such as the rule of law, case studies of public lawsuits which contributed to securing human rights in Japan, the structural significance of the independence of lawyers, the social duty of lawyers, and the role of interpreters in ensuring due process. In addition to holding seminars, we met with several civil society groups in Myanmar and discussed the human rights situation in the country. We would like to express our appreciation to those who attended the seminars and for the support we enjoyed from various organizations, including the Yangon Bar Association, PANDITA, Burmese Women’s Union, Women’s League of Burma, Independent Lawyers’ Association of Myanmar(ILAM), and 88 Generation Peace and Open Society. HRN intends to continue conducting training and holding seminars to further the human rights education of the lawyers, students, and leaders of civil society organizations working towards securing human rights in Myanmar. Future plans for the project include extending our activities to provincial cities and responding to the needs women’s groups, youth, and ethnic minorities have for human rights education. human rights NGO based in Tokyo, Japan, whose membership is primarily comprised of lawyers, scholars, journalists, and others working across national boundaries to address human rights violations. Human Rights Now is an NGO possessing UN special consultative status, which acts to address serious human rights violations across the world, operating fact-finding missions and advocating directly to the UN and other stakeholders. At the same time, we place emphasis on empowerment through grassroots level capacity building and education on human rights. These activities are based on our belief that the people living in a country are the actors in changing the status of human rights in that country. Human Rights Now will continue to support community members around the world so that they themselves can play an active role in securing human rights.